PF-5006739 is a potent casesin kinase 1δ/ε inhibitor (IC50 values are 3.9 and 17 nM, respectively). Mediates circadian rhythm phase-delaying effects in vivo. Attenuates opioid drug seeking behaviour in addiction in vivo models. PF-4800567 is a selective inhibitor of casein kinase 1ε (CK1ε; IC50 = 32 nM) with greater than 20-fold selectivity over CK1δ. 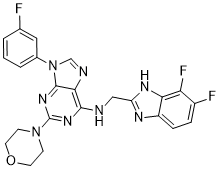 TA-01 is a potent CK1 and p38 MAPK inhibitor, with IC50s of 6.4 nM, 6.8 nM, 6.7 nM for CK1ε, CK1δ and p38 MAPK, respectively. Ellagic acid is a natural antioxidant, and acts as a potent and ATP-competitive CK2 inhibitor, with an IC50 of 40 nM and a Ki of 20 nM. IC261 is a reversible, ATP-competitive inhibitor of casein kinase 1 (CK1) that inhibits Ckiδ and Ckiε (IC50 = ~1 μM for both), as well as CK1α (IC50 = 16 μM). SR-3029 is a potent and selective casein kinase 1δ/1ε (CK1δ/ε) inhibitor with potent antiproliferative properties SR-3029 shoed IC50:= 97 nM in MTT assays against the human A375 melanoma cell line and have physical, in vitro and in vivo PK properties suitable for use in proof of principle animal xenograft studies against human cancer cell lines. Emodin is a naturally-occurring anthraquinone found in a variety of plants used in traditional Chinese medicine. Purified emodin has diverse effects, including the suppression of inflammation, dyslipidemia, and cancer. D4476, a cell-permeant inhibitor of CK1 (casein kinase 1), suppresses the site-specific phosphorylation and nuclear exclusion of FOXO1a. 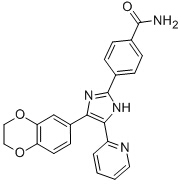 LH846 is a selective inhibitor of casein kinase (CK) 1δ (IC50 values are 290 nM, 1.3 uM and 2.5 uM for CK1δ, ε and α); displays no inhibitory activity at CK2. PF-670462, a selective CK1 ε/δ inhibitor, causes a significant phase delay in animal models of circadian rhythm; it remains unclear whether one of the kinases has a predominant role in regulating the circadian clock.